Home Archive for category "EJIL Book Discussion"
I would like to comment on a significant part, albeit a rather small one contentwise, of Dr Sinclair’s very interesting book – To Reform the World: the use of administrative law analogies in relation with the making of modern international organizations. Before going further, we would need to agree on a definition of analogy. Popular culture may help in that regard. According to Britta Perry, a student at Greendale Community College in the TV Show Community (video available here), an analogy can be defined as “a thought with another thought’s hat on”. In her convincing de Beauvoiresque analogy between “weddings” and “little girls’ tea parties”, Britta however highlights three differences between them, while analogies are generally focusing on “accepted similarities between two systems” (P. Bartha, “Analogy and Analogical Reasoning”, The Stanford Encyclopedia of Philosophy, available here). Legal analogy, for Chaïm Perelman and Lucie Olbrechts-Tyteca, is not defined as an imperfect resemblance, but as an identity of relations within different domains (See C. Perelman & L. Olbrechts-Tyteca, La nouvelle rhétorique. Traité de l’argumentation, PUF, 1958, p. 500). Analogy then implies that a is to b like c is to d. The goal is to explain a relation that is unknown (a to b), called theme, with the help of a known relations (c to d), called phore. The theme states what one means or wishes to prove, while the phore states what one says so that it may better be expressed or proven. For example, One good piece of news does not guarantee happiness is like one swallow does not make a summer (O. Reboul, “The Figure and the Argument”, in M. Meyer (ed. ), From Metaphysics to Rhetoric, Kluwer Academic Publishers, 1989, pp. 175-176). The phore is generally more concrete, or at least more familiar, than the theme. It is the resemblance between the two relations which allows us to infer the fourth term from the three others. We prove b given a, c and d, since the relation between a and b resembles that between c and d. The point of the reasoning, in this example, is that “one has no right to generalize”. We should also distinguish analogies from metaphors. The metaphor occurs when analogy is condensed through the omission of certain terms. It reduces the resemblance to an identity by evacuating the difference. One can say to reassure an old person anxious about death that it is only a kind of sleep. This metaphor implies an analogy : that death is to living like sleep is to waking (O. Reboul, “The Figure and the Argument”, op.cit., pp. 175-176). Over the contest hovers, as in all ages, a concept of society formulated and fostered by intellectuals. This is not a reflection of reality, but a goal and hope of good men. The conviction in a linear teleology of progress is fundamental to modernity – and to liberal democracy, its exemplary political formation. The supposition is that history has a telos, and that telos is liberalism. Yet in this era of profound disorientation, against the backdrop of increasing attention to the rise of ‘illiberal’ democracies, history is, as Wendy Brown has commented, becoming ‘both weightier and less deterministic’. The idea that law has evolved to some higher state of reason from which pinnacle it can trump over politics and ideology has proved an imaginative cul-de-sac. Attention to history is important, not to reinforce an artificial progress narrative, but to engender consciousness of the fluidity of politico-legal discourse and its capacity to change (see Martin Loughlin, Sword and Scales (2000), at 225-6). In To Reform the World, Guy Fiti Sinclair has written a book of astonishing reach and intricacy. Its scope brings to mind the words of Woody Allen, ‘Can we actually “know” the universe? My god, it’s hard enough finding your way around Chinatown’. Yet this is not a book purporting to provide a blueprint for global order. One of the most interesting and insightful contributions of the book, and something that sets it apart from other international legal work on global governance, is its resistance to normative conclusions. Sinclair has developed a work of critical history, mapping the ‘constitutional growth’ of international organizations, yet without presenting this development as in any way teleological. Instead, the effect of the book is to debunk quietly yet powerfully any idea of the inevitability of any particular theory of global governance. 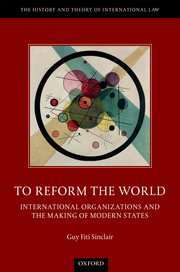 I associate Guy Sinclair’s To Reform the World: International Organizations and the Making of Modern State very strongly with its cover image, Kandinsky’s ‘Circles in a Circle’ (1923). Circles are privileged visual representations of the global, but they only became so at a moment when scientific innovation permitted the apprehension of the earth as a globe. This is a helpful reminder that our (global) vision is tied intimately to the perspective from which one sees. This concern with perspective is central to Sinclair’s work. At its core, the book explores the construction of a novel institutional and political site from which to survey, and thus act on, the world. In what follows in this post, I take perspective as a central thread for some diverse comments on the book: the perspectives which Sinclair opens up, and those we might explore in future. There is currently an explosion of historical work probing the social, intellectual, institutional and technological shifts associated with twentieth-century transnational activism, international organization, and what has now come to be called ‘global governance’. Sinclair brings to this scholarship a distinctive focus on law. The question animating this book is a legal one, or at least reflects the stance of a modern public lawyer: how are we to make sense of the expansive activities undertaken by international organizations (IOs), given their parsimonious founding texts? Once the question is posed, however, Sinclair does not confine himself to answering it from a perspective internal to law (i.e., determining whether a given exercise of powers is valid in accordance with the applicable law at the time). Rather, he reformulates it into a broader, socio-legal question: How is it that the expansion of the powers of international organizations came to seem necessary and desirable despite lacking a clear textual justification? Guy Fiti Sinclair’s To Reform the World was, for me, one of the books of the year when it came out in 2017. It is a model of legal scholarship, and does two things very well that are oh so difficult to bring together. First, Sinclair is an excellent lawyer – he knows the law, he knows what to focus on and what to ignore, and what is more, he is interested in the law, both its doctrinal detail and its political role; sadly, this interest in the law is not always present with people interested in the politics of law. Second, and related, he brings out this political role with verve and cogency. The work is scholarship of the highest order, a credit to its author and to those who trained him. I find, in all honesty, little to comment sensibly on; this is one of those books (few as they are) which I wish I had written myself. One can of course always ask questions: why focus on the World Bank and not, say, UNHCR? Why not include the work of an organization that proclaims to exist outside and beyond the law, like the OSCE? Could the same type analysis be applied to an interest organization like, say, the International Olive Council? Those questions can always be asked – the world of international organizations counts at least 300 varieties, and we tend to look at some of them a lot more than at others. It is almost a disgrace, for instance, that not more is known about a hugely important global governance institution such as the International Organization for Migration, responsible for establishing border management practices across the world and even for running migrant processing centers on behalf of member states, but steadfastly ignored in the legal literature. But it would be churlish to go down this path. Instead, I want to address an element that usually stays a little under the radar and to which I cannot attach a proper label. It has something to do though with the political role of legal academics. Sinclair, without advertising it and (blissfully) without posturing, adheres broadly to the critical school. He may not be a card-carrying crit, but his work is sensitive to and inspired by critical givens (the indeterminacy thesis, the oscillation of law between apology and utopia, the notion that law typically serves as a vehicle for someone’s political project, that sort of thing). There is a Foucauldian flavor to the work and Sinclair clearly has taken the critical revolution to heart. And the book is all the better for it; indeed, it would have been impossible to write To Reform the World without something of a critical mindset. Editor’s note: Continuing a tradition started by Isabel Feichtner a few years ago, EJIL’s Review Editor, Christian J. Tams, invited members of the EJIL board to offer short reflections on their favourite books of the year 2018. In the following days we will present some selections here on EJIL:Talk! They comprise a wide range of books, from (a few) doctrinal legal texts, to (many more) historical accounts and works of fiction. Unlike in many official book prize competitions, 2018 does not necessarily stand for the year of publication; rather, board members were asked to list books they read or re-read this year, and found inspiring or enjoyable. Today we give you Guy Fiti Sinclair’s favourites. None of my chosen books would be found in the ‘341’ (or even ‘340’) stacks in a Dewey Decimal classified library, or in the KCs in a Moys-organized library such as the one at my law school. This is not because I haven’t read any books in those stacks this year. To the contrary, it turns out, somewhat to my own surprise, that I’ve actually managed this year to work my way through a fair few international law books – and books about international law, to adopt a to adopt a useful distinction I have heard from Joseph Weiler more than once – and read parts of many more. Nor is it that I’m worried that if I start listing books by international lawyers, one or another colleague will feel offended that I didn’t mention theirs (although I must admit this has crossed my mind). Rather, I have decided to highlight books that I have read this year which spoke most directly to my current interests (one might say obsessions). Like many people, I suspect, I have spent much of the past year oscillating between trying to understand our current perplexing moment and trying not to think about it. These books have helped, one way or the other.